NHK World's TV program "Face To Face " is featuring Yodogawa Technique! This program will be on air about 160 countries on January 27, 2019 from 10:10am (In Japan time) and repeated for 4 times. You can also view this via internet and video on demand. 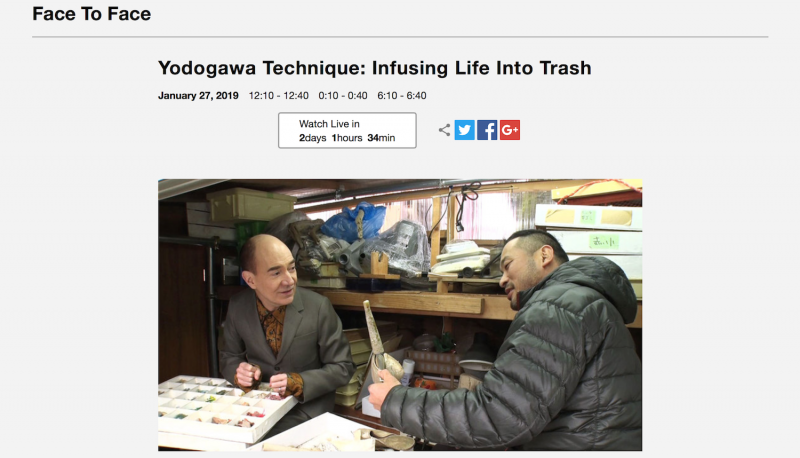 ★NHK World "Face To Face"
Our guest is Yodogawa Technique, an artist who transforms trash and flotsam into stunning collages. He travels worldwide, interacting with local communities to create thought-provoking works. In the Maldives he formed a huge fish with the plastic bottles that are endangering its coral reefs. In memory of all that was swept away by the devastating tsunami of 2011, he created a "Wakabayashi 100 Years Swing" using what was left of the windbreak forests. His work has been featured in school textbooks to inspire eco-awareness. About the program :Face To Face is a monthly talk show with the people making a difference in Japanese society today. The show's host is Robert Campbell, who is an expert in Japanese literature and culture.